Perhaps what’s elevated Plumlee so much this season is the play of his teammates, particularly that of young breakout players Rasheed Sulaimon and Cook. Last season, Duke ran its offense through Austin Rivers, an electric one-on-one scorer but limited passer and often poor decision-maker. The lack of a true point guard killed Duke in its halfcourt sets and made it difficult to create opportunistic scoring touches in the post for players like Plumlee, who underachieved to an 11.1 PPG scoring average. But running the point this season is Cook, a sophomore former high school All-American who brings a play-making element to the team that requires attention from help defenders but also a pass-first mentality that lends to crisper execution in the offense. Joining him on the perimeter is the highly-touted freshman Sulaimon, who’s proven fearless in the early season as a strong scoring option through a diverse offensive arsenal centered around a slashing game. Sulaimon dropped 17 points on Wednesday night while Cook played a terrific floor game to the tune of 12 points, eight assists, and six rebounds. He also knocked down six consecutive free throws with under 1:00 to play to seal the Duke victory. Contests against Kentucky, Louisville, and Ohio State – all legitimate national title contenders – have given Coach K an opportunity to measure his new-look Dookies against top competition, and he probably didn’t foresee victories coming in each one. The Blue Devils still have plenty of things to work on, and Krzyzewski can just throw on Wednesday night’s first half tape to teach lessons about defensive rebounding and toughness, two areas where Duke suffered against the athletic Buckeyes in building an early deficit. But teaching is always easier after a win, which is what Duke earned behind an aggressive second half game plan that all came together when Plumlee was able to execute so well on his post touches. Throw in the contributions of veteran stars Seth Curry and Ryan Kelly, plus value from talented reserves Alex Murphy, Amile Jefferson, Tyler Thornton, Josh Hairston, and Marshall Plumlee (when he gets healthy), and the Blue Devils are as complete a team as there is in Division I basketball. 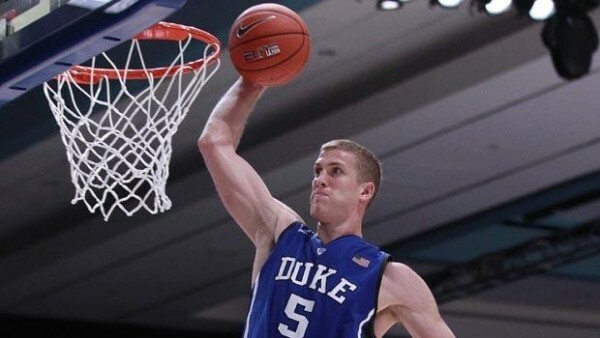 If the senior leader and elder Plumlee keeps playing at this high level, Duke’s early 2012-13 start shows it has all the pieces of a national championship favorite, plus an iconic coach who knows how to put them together. This entry was posted on Thursday, November 29th, 2012 at 1:45 am by EJacoby	and is filed under night line, Regular Features, rtc analysis. Tagged: acc, alex murphy, Amile Jefferson, austin rivers, big ten, big ten/acc challenge, blue devils, buckeyes, coach k, deshaun thomas, duke, josh hairston, marshall plumlee, mason plumlee, mike krzyzewski, ohio state, quinn cook, rasheed sulaimon, ryan kelly, seth curry, tyler thornton. You can follow any responses to this entry through the RSS 2.0 feed. You can leave a response, or trackback from your own site.